The leader in turning blockchain strategy into business outcomes. Top industry and technical experts. Unrivaled network-convening prowess. And the leading blockchain for business platform. Learn how to become one of the visionary companies around the world driving game-changing outcomes with IBM Blockchain Services. To get you started on your blockchain journey, we'll help you focus on business outcomes, prioritize use cases and develop a minimum viable product (MVP). Driven by IBM Garage Method, we help you validate your use case, identify network participants and assess the business value of your idea. IBM Blockchain Services establishes your business case and delivers a minimum viable product (MVP). The American Association of Insurance Services (AAIS) wanted to automate insurance regulatory reporting and streamline compliance requirements. Here's how we helped them build their MVP in six weeks. Launch your pilot and move into production, defining your network’s operating model, governance rules, onboarding processes for new members and more. IBM Blockchain Services unleashes deep expertise to set up your consortium and its governance; guides legal entity creation and regulatory compliance; leads funding models and monetization policy; recruits and onboards network members, and deploys your network on the IBM Blockchain Platform in the infrastructure of your choice. Our business and technical experts help you create and deploy an enterprise-grade blockchain network processing real transactions, supported by a validated business case and a clear, actionable roadmap for the future. we.trade and seven European banks brought their blockchain-based trade finance pilot to us. Here’s Roberto Mancone, co-founder of we.trade, describing the process of bringing their network to life – and how it’s launching a global trade transformation. Integrate with new technologies and interoperate with other networks to scale your solution, unlocking transformative new value. To continue your blockchain success, we help you extend member recruitment and onboarding; assess and maintain network performance; integrate technologies like IoT, AI, Advanced Analytics and others; release new features and interconnect with other blockchain networks. Depending on your desired business outcome, IBM Blockchain Services provides you with a live, scaled network providing real returns, a network growth strategy including new and innovative features, and more. By leveraging IBM Food Trust™ and IBM Blockchain Services, Golden State Foods is combining blockchain, cognitive analytics and IoT to pilot a new food freshness solution. Read how Chief Technology Officer Guilda Javaheri describes their collaboration with us. 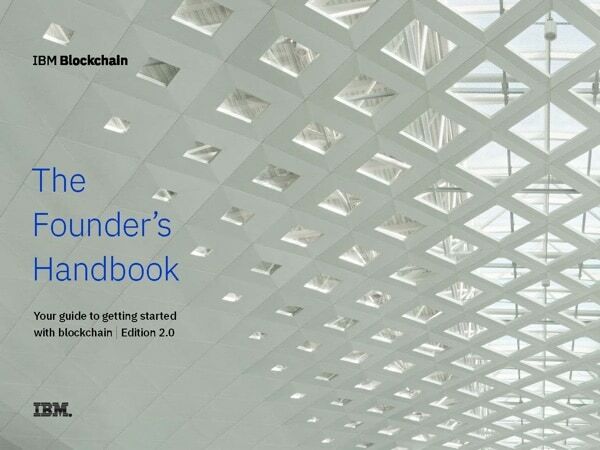 Based on engagements with clients around the world and active networks transforming industries, The Founder’s Handbook outlines what we’ve learned at IBM Blockchain Services to turn an idea on paper into a value-producing blockchain network. This is your step-by-step guide to identifying your business problem, building an ecosystem, business model design, governance, legal considerations and more. You have a vision of how blockchain can change your business. We have the expertise and the platform to bring it to life. Let’s talk today.